The first prominent session guitarist whose work was featured on a wide array of West Coast records in the late 1940’s and early 1950’s at a time when the instrument took a back seat to the saxophone and piano in most arrangements. Webb’s versatile style, his uncanny ability to play noteworthy licks that still fit into the overall sound without demanding the spotlight and his availability for the ever growing number of Los Angeles-based labels that needed reliable musicians for countless sessions, had a lot to do with the guitar’s increased presence in rock songs during this time. Not much biographical information is known about Mitchell “Tiny” Webb. His nickname was a joke because of his rather large size and it’s been said that he died young as a result of obesity but that’s unconfirmed. He first gained notice playing behind Jay McShann, a notable jazz-blues pianist of the 1940’s whose band spawned a number of future stars, one of whom, bluesman Jimmy Witherspoon, was backed by Webb on a few early sides. 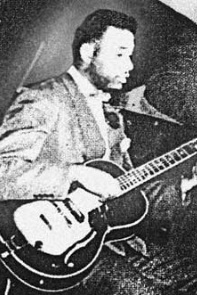 Webb found most of his work as a session guitarist, frequently associated with tenor sax ace and producer Maxwell Davis, cutting sides over the years behind Ray Charles, Little Willie Littlefield, Crown Prince Waterford, Peppermint Harris and Marvin & Johnny in the rock field, as well as Hadda Brooks and Bumble Bee Slim in other genres. It was for the latter that he contributed guitar on “Ida Red”, the song which served as the blueprint for Chuck Berry’s “Maybellene” and you can clearly hear his debt to Webb’s style and clean tone on many of Berry’s biggest hits. Though he released very few solo recordings, Webb was a vital part of the short-lived group Eddie Williams And His Brown Buddies, alongside pianist Floyd Dixon, drummer Ellis Walsh and Williams on bass. The group cut a number of rock sides in 1949 that drew from their backgrounds in other styles before Dixon left in 1950 followed by Webb soon after. By the mid-1950’s Webb’s status becomes murky, with the possibility he passed away just as the instrument whose rise in rock circles he presaged was fully underway. As sideman… to Crown Prince Waterford. Webb’s alternately bluesy and jazzy guitar highlights a track only peripherally related to rock that’s further done in by Waterford’s uncertain vocal approach. As sideman… to Floyd Dixon.